Jesse Owens Memorial Park and Museum Statue that was unveiled with the help of Ruth Owens in Oakville, Alabama. The bronze statue stands strikingly at the top of the hill on the 30-acre park in Oakville, Alabama. The place that Jesse once called home. Brando Medenica with his design ideas in his studio in Birmingham, Alabama. Medenica decided there was a strong message to illustrate through his art, “The Olympic rings were like a finish line,” he said. “They represented a barrier. 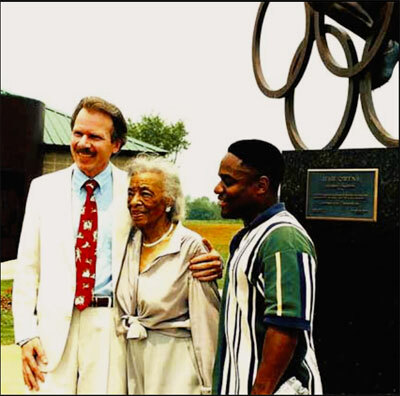 Owens broke so many barriers.” The design he envisioned depicted Owens bursting through the Olympic rings to represent all the racial and economic barriers that he broke in becoming an Olympic hero. 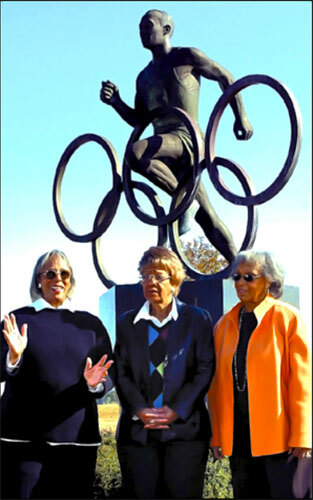 (L-R) Marlene Owens Rankin, Beverly Owens Prather and Gloria Owens Hemphill in front of the statue at the park. 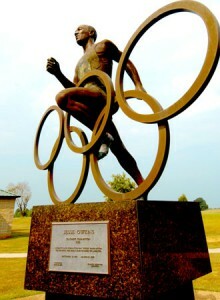 However, the vision of Medenica’s statue and its message, led to a two-year battle with the U.S. Olympic Committee. Citing copyright laws, they told Medenica he could not use the Olympic rings. But determined, he relentlessly called and wrote the committee and even sought the help of Owens’ daughter, Marlene Owens Rankin. 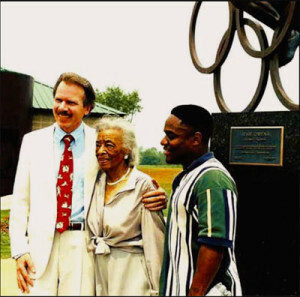 Mrs. Rankin supported Medenica and encouraged the Olympic Committee to approve the use of the rings. 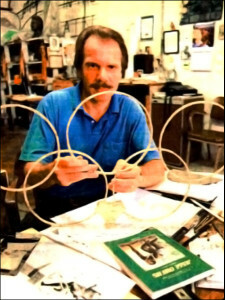 Ultimately – exactly two years to the date of his first letter, the Olympic Committee gave him permission to use the rings. Medenica had to finish his three-year project in around four months. 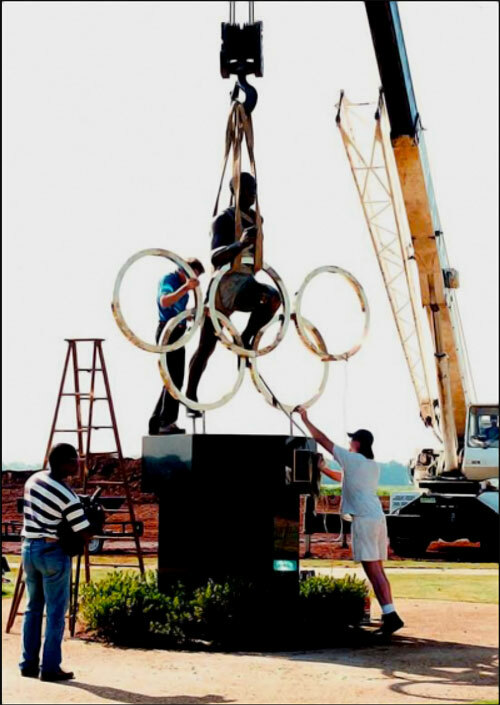 The sculpture was scheduled to be unveiled at a highly publicized ceremony on June 29, which included Owens’ wife and daughters as well as the arrival the Olympic torch. With only two days before the official ceremony, the sculpture was being anchored on its base. Statue being permanently anchored on its base within only a few days ahead of the Olympic torch arrival. Branko Medenica (sculptor) and Ruth Owens after the statue dedication at the Jesse Owens Memorial Park and Museum. 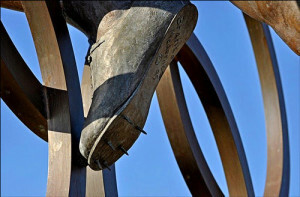 A close up of the intricate detail – down to the cleats on Owens’ running shoes, on the eight-foot, one-ton bronze work of art designed by Branko Medenica.